Amidst breathtaking flora and fauna, divine scents and the soothing sounds of cascading water, Park Shore Resort has carved out a heavenly niche that is centrally located in a beautiful Naples neighborhood setting. Thick, lush gardens encompass this sanctuary, which interconnects with waterways and serene, botanical walkways. It's hard to believe that just beyond the thirteen acres of Park Shore's nature-approved enclave is Naples' world-famous shopping, entertainment, nightlife and world-famous shoreline - recently named "America's Best All-Around Beach" by The Travel Channel. 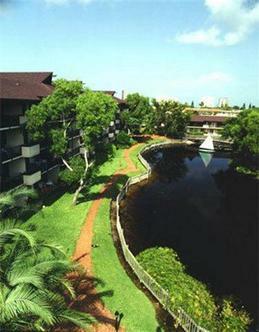 Park Shore Resort features spacious one- and two-bedroom condominium suites that all overlook the tropical grounds and waterways. Each suite includes a living room, dining area, two full baths, private balcony, a fully appointed kitchen with refrigerator, stove, dishwasher, microwave, cookware and coffee maker, cable TV's, DVD player, free HBO, daily housekeeping, ceiling fans, alarm clock with radio, work desk with lamp, hair dryer, voice mail, data ports, iron and ironing board. Just a short walk across the bridge allows you to enjoy our swimming pool, whirlpool spa, waterfall, the Island Club Restaurant, barbecue grills and gazebo area. Stroll around the cobblestone paths that wind through waterfalls and tropical scenery, or simply unwind with a game of tennis or racquetball. No same day booking up to 3pm EST.